I love combining teaching and the holidays. I've gathered up some Easter-themed resources for you to use with the kids. Here's a fun bunny coloring worksheet for kids to practice reading their color words. I just posted it at my website. Just click on the picture to go to my website to get your free copy. 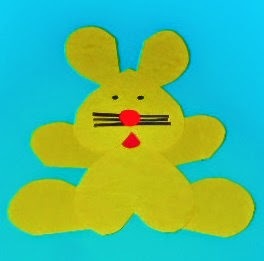 If you'd rather make a fun, easy bunny craft with the kids, click on the picture to get directions. Do you have lots of plastic eggs? 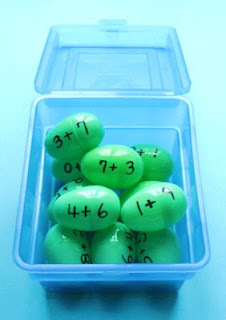 Use them to help kids practice their addition or multiplication facts. Click on the picture for directions. 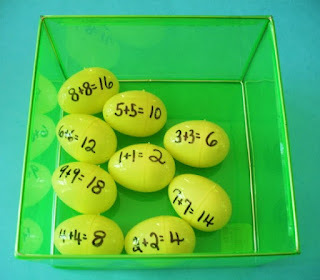 Practicing sums of 10 is another way to use the plastic eggs. Click on the picture for details. Do you have some inexpensive paper plates? Use them to make clocks. Kids need lots of practice with telling time. 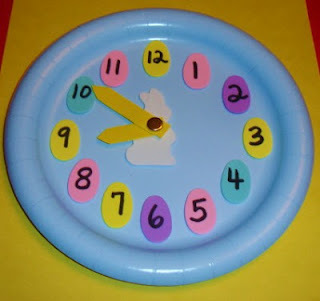 Make clocks for all the holidays! Click on the picture to get directions. For more Easter and Spring Ideas, visit my SPRING TEACHING IDEAS PINTEREST BOARD. Click on the picture below. Happy (almost) Spring and Easter!! !